The 2012 Porsche 911 Carrera 4 GTS coupe's standard all-wheel-drive offers superior handling on all sorts of road conditions and in nearly all weather conditions, as well. The Carrera 4 GTS is very powerful. 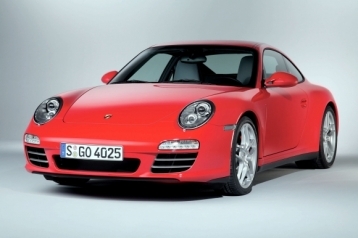 It features a 3.8-liter flat-six engine, which delivers 408 horsepower (23 horsepower higher than the 911 Carrera 4S). Not only is it powerful, but it's fast as well. The C4 GTS coupe achieves an amazing top track speed of 187 mph and a zero-to-sixty time of only 4.4 seconds with its standard six-speed manual transmission. This time shortens to 4.2 seconds with the optional PDK seven-speed transmission. Technology and comfort features are plentiful, but optional pieces can get pricey rather quickly. Standard features include leather sport seating and a sport steering wheel, rain-sensing windshield wipers, heated exterior mirrors, cruise control, HomeLink (garage door system), and Bluetooth. Safety features are impressive for the Porsche 911 Carrera GTS coupe. These include several airbags, Porsche Side Impact Protection, an immobilizer and alarm system, LED and Bi-Xenon taillights and headlights, and optional Porsche Ceramic Composite Brakes. As far as its aesthetic appearance is concerned, the C4 GTS coupe is unparalleled (except by its fellow Porsche 911 Carrera models). Its wide, aggressive body style is gorgeous, and its cabin is just as appealing as the exterior. Extra special sporty features, including direct fuel injection, cylinder specific knock control, hydraulic valve adjustment, electronic throttle, aluminum block and cylinder heads, electronic engine management, a resonance intake manifold, and two 3-way cataytic converters, really set this Porsche 911 model apart from the lineup. Optional features and packages are pricey and can add up quickly when you add features you would normally expect to be featured on a luxury sports car, like Satellite Radio, navigation, and a premium audio system.